According to author Mary Anne Staniszewski in her book Creating the Culture of Art, Leonardo da Vinci’s Mona Lisa would not have been considered Art in its time (1503-05) as the concept of Art is a recent invention of the past 200 years. She states that Art is a modern invention; its meaning and value is strengthened in the system of art institutions, art histories, art collections, etc. By having the institutional system in which art is exhibited in a gallery or museum, written about by critics and historians, taught by professors in academic settings, bought and sold in auction houses, and collected in a critical manner, the work of art then becomes defined as Art by this process. So now, since we have the concept of Art and the appropriate systems and institutions to understand something as Art, we do look back in history and consider works like Michelangelo’s creations and prehistoric paintings such as the Lascaux Caves as examples of Fine Art. However, when these works such as Michelangelo's painting of the Sistine Chapel, or the Lascaux Cave paintings were first created, they were not created as artworks, i.e. as aesthetic objects to be displayed in an art museum and admired by viewers for their pure visual qualities. Instead, these creations had entirely different purposes and functions. According to Staniszewski, Art began in the early 20th century in Europe with works by Marcel Duchamp and Pablo Picasso as early examples of fine art. 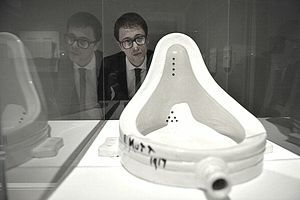 Citing the example of "Fountain," which is Duchamp's readymade sculpture: the artist took an ordinary porcelain urinal, turned it upside down, signed it "R. Mutt 1917" and displayed it in an art exhibition. It was the placement in an art institution, that transformed the common bathroom item into a work of art. Once an art object is displayed in an art institutional-type setting such as a gallery or museum exhibition, then it becomes Art. So visual creations that pre-date the early 20th century would technically not be considered Fine Art, and perhaps would more accurately be considered as Cultural Production.